Saint Sebastian is a very popular patron saint as he is the patron saint of Athletes and Soldiers. Due to his unwaiving commitment to Christ and the courageous way he faced his martyrdom, he serves as an example of true love of God. He is usually depicted standing in front of a tree with an arrow pierced through him. A soldier of the imperial army from Narbonne (Gaul) or Milan (according to St. Ambrose), he was martyred for the Faith at Rome during the reign of the Emperor Diocletian. His Burial place at the Cemetary - ad Catacumbas - along the old Appian Way is distinguished by a continuous cult down the centuries. The Roman liturgy has always accorder him a privileged place. Iconography depicts him as a martyr, pierced by arrows. He is invoked for healing from both physical and spiritual wounds. 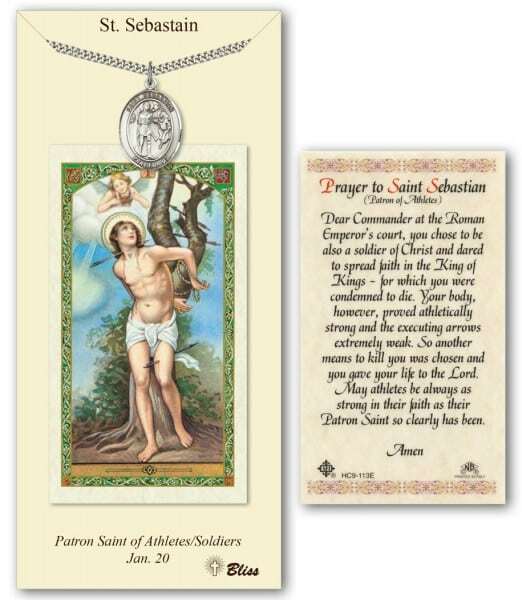 Your favorite athlete will love this prayer card and personalizable medal! If you enjoy this guidance prayer, you'll love this prayer card!